We are Canada's favorite supplier of reflector prism tapes and lure eyes to manufacturers, tackle shops and sportsmen. Whether you are shore fishing for steelhead or trolling in the Northwest Territories for trophy Lake Trout we have prism tape in the hundreds of colours and finishes to meet your needs. 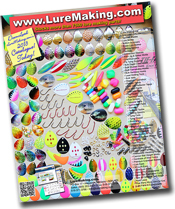 LureMaking.com stocks the largest selection of lure / prism tapes available in Canada. There is positive evidence that eyes on a lure play a critically important part in it's productivity! Every lure maker should always have a good selection of eyes on-hand.